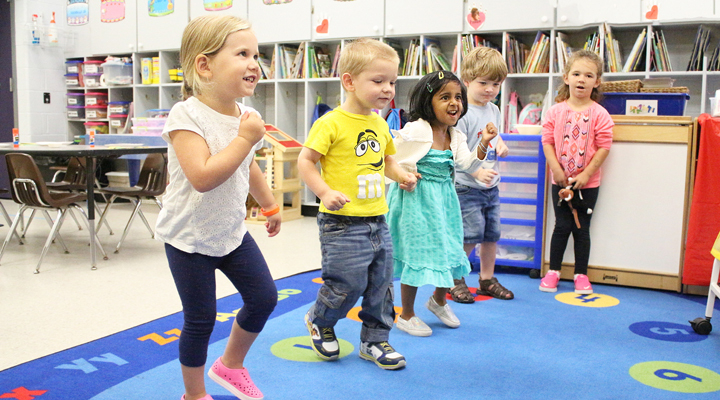 Our Lady of Grace Preschool seeks to be a joyful center of the New Evangelization that promotes active and engaged learning through faith, discovery, collaboration, and service. Our Lady of Grace Preschool focuses on the formation of students as young disciples of Jesus Christ. It is our mission to prepare this community of early learners for higher education by challenging their developing minds and nurturing their spirit, while guiding them to lead with faith and excellence. The primary purpose of the Our Lady of Grace Preschool is to create a caring environment in which we can educate the whole child in the context of the Catholic faith. Utilizing a well- planned and hands on curriculum, we lead children toward spiritual, emotional, moral, intellectual, physical, and social development. The vision and mission of Our Lady of Grace Preschool can be seen in action every day. All of our students are encouraged to explore and engage in activities both in and outside of the classroom so they can grow and develop in every facet possible! To see our school in person please contact our Director, or inquire today to learn more!